If you just threw a huge Fourth of July bash, you’re probably all BBQ’d-out like I am. You might also have some leftover ingredients from those pork burgers and coleslaw you made for your family and friends. There’s no need to throw out your leftover ground pork or cabbage if you have a bit of Asian seasoning in your pantry. 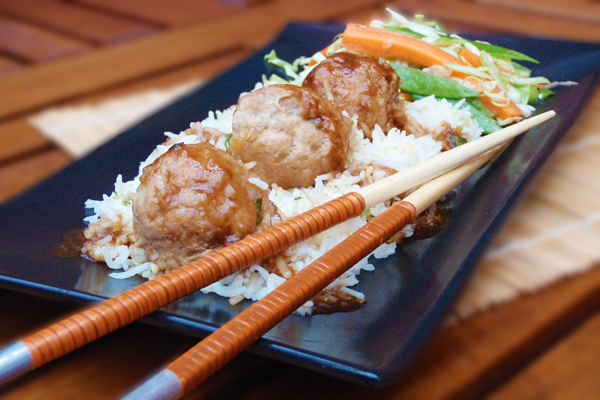 Instead, invite some hungry guests over to try these Asian meatballs and slaw! I actually made this recipe for my family back in June when the gloomy weather prevented us from celebrating the start of summer with some old-fashioned barbecuing. Stuck indoors, I decided to use some of the ingredients we would normally need for a barbecue and make a dinner that’s a twist on boring old meatballs. These meatballs and slaw are so easy and quick to make, I highly recommend both recipes to home cooks of all experience levels! They are a bit healthier than eating burgers and coleslaw, too, so you’ll get bonus points from your guests who want to redeem themselves from overindulging on the Fourth. In a large bowl, mix together ground pork, 2 teaspoons of sesame oil, Panko, 1/2 teaspoon ground ginger, eggs, 3 minced garlic cloves, and sliced green onion until combined well. Shape into 1-inch balls and place in a 9×13-inch baking dish. Bake for 10-12 minutes, or until meatballs are golden on the outside and no longer pink on the inside. While the meatballs are baking, whisk together hoisin sauce, rice vinegar, soy sauce, and remaining minced garlic cloves, sesame oil, and ginger until blended. Once meatballs are finished cooking, pour the sauce mixture over the meatballs and gently stir them until covered. Serve warm over jasmine rice, and sprinkle with sliced green onion for garnish. In a small bowl, whisk together soy sauce, lemon juice, toasted sesame oil, and sesame seeds. In a large bowl, combine the cabbage, snow peas, and carrots. Add half of the dressing, toss to combine and taste. Keep adding additional dressing until you get the desired flavor. Categories: Blog, Eating, Featured, Healthy Recipes, Just Recipes, and Recipes. I'm Cooking For...: BBQ, Dinner Party, and Easy Dinner. Type of Food: Meat and Sides.